Posted on Thu, Feb 2, 2012 : 6:37 a.m. The Penny Stamps Lecture Series will host artist and entrepreneur Robert Hammond at the Michigan Theater on Thursday. 5 p.m. Hammond will discuss the High Line, a new public park atop an abandoned elevated rail line on Manhattan’s West Side. Free. The Michigan is at 603 E. Liberty St., Ann Arbor. 734-668-8397. 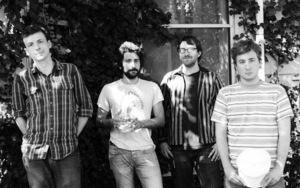 Roots band Frontier Ruckus performs Thursday night at the Ark in downtown Ann Arbor. Enjoy a “Terroir of Pinot Noir Night Dinner with Brian Loring” at Vinology. 6:30 to 8 p.m. Taste the qualities of vineyard-site through five eye-opening courses with Brian Loring. The Loring Wine Company produces vineyard specific Pinot Noir and Chardonnay for guests tasting delight. Seating is limited. Prices vary. 110 South Main St., Ann Arbor. 734-222-9841. Join in on the “Crazy Wisdom Salon: Occupy Wall Street (and Ann Arbor)” at Crazy Wisdom Tea Room. 7 p.m. Alan Haber and Odile Hugonot Haber will help deconstruct all that has been happening. In the ‘60s, Alan was an initiator of Students for a Democratic Society (SDS), and Odile was a participant in the May 1968 uprisings in Paris. An evening of lively discussion is intended. Free. Crazy Wisdom is at 114 S. Main St., Ann Arbor. 734-665-9468. Roots band “Frontier Ruckus” will be at the Ark. 8 p.m. What's unique about this band is that its uses country instrumentation to depict not a rustic utopia but life along the interstate as most of us live it. $15. The Ark is at 316 S. Main St., Ann Arbor. 734-761-1800. Fri, Feb 3, 2012 : 1:08 a.m.
Brian Loring is a ROCKSTAR of Pinot Noir! You've GOT to try his wines! Can't wait to see the Frontier Ruckus.